We Are the New Design Thinkers! “How many of you consider yourselves as design thinkers?” asked our guest lecturer Gijs van Wulfen (Innovation Consultant and founder of FORTH Innovation method) when our SID 2014 group started the Design Thinking course. Not so many hands rose at that point, I was certainly hesitating. However, we were soon about to learn what Design Thinking is, what kind of challenges we face in innovation processes, and what kind of methods and tools we could use to improve our skills as design thinkers. 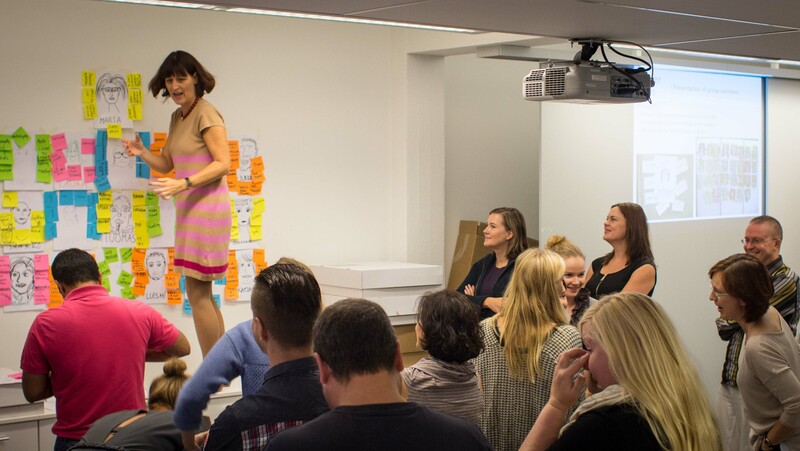 In addition to Gijs, we had the pleasure of having another great guest lecturer, Design Professor Katja Tschimmel from ESAD Portugal, to teach us more about Design Thinking. 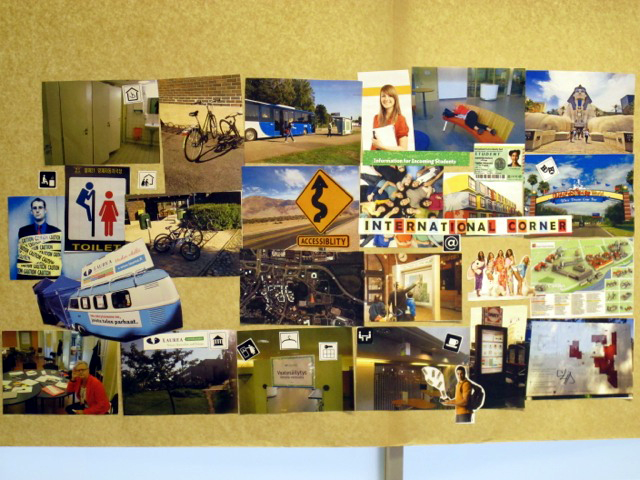 The course started with simple visual Design Thinking exercises. Katja and Gijs then teached us about Design Thinking in general, innovation processes and methodology, as well as Design Thinking tools. After the theoretical part it was time to put our design thinking abilities to test! Once we were divided into teams our assignment was to come up with a new service for better learning. 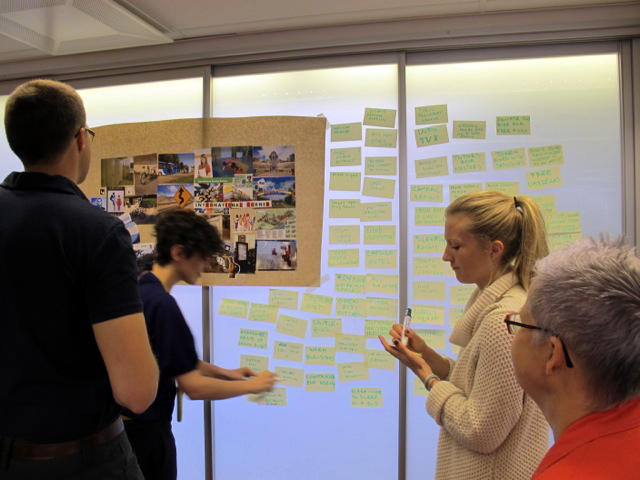 We learned how to use Design Thinking tools such as mind mapping, foto safari, image interview, visual research, moodboard, brainwriting, and desktop walkthrough. In the end we communicated our new concept business models to the audience and got feedback. Katja hanging up our beautiful group picture. 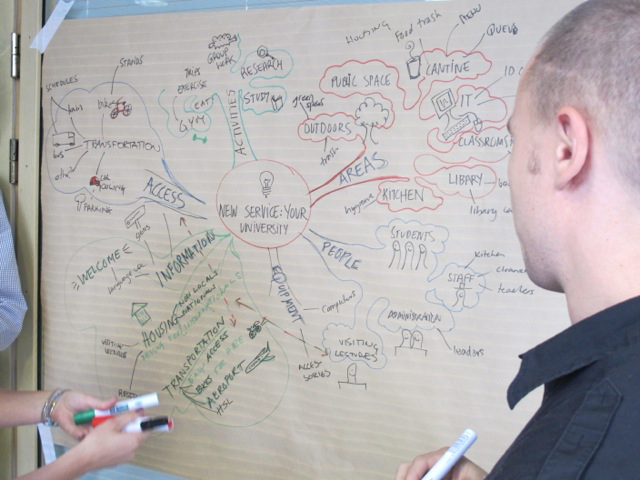 So, what does Design Thinking mean exactly? Katja Tschimmel’s research paper Design Thinking as an effective Toolkit for Innovation (2012) states that Design Thinking is nowadays understood as a complex thinking process that leads to transformation, evolution and innovation, to new forms of living as well as to new ways of managing business. Liedtka & Ogilvie (2011) define Design Thinking as a systematic approach to problem solving. I especially like how they state; “You’ve already got the power. You just need to figure out how to use it“. No supernatural power or magic is required and you can safely try it at home! 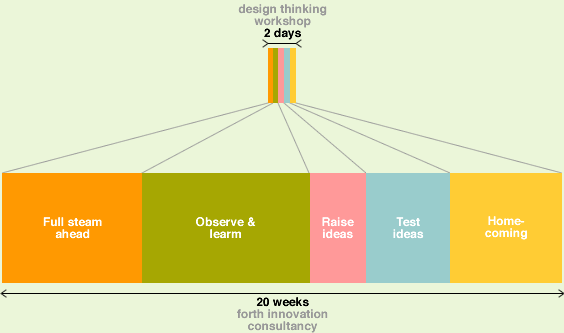 During our two-day Design Thinking course we had Gijs’ FORTH Innovation method as a basis for our learning activities. In real situations this method would take several weeks, or months to be exact. Check out this short introduction video to FORTH Innovation method by Gijs. Professor and researcher Katja Tschimmel and ideation facilitator Gijs van Wulfen showed us where the Rabbit Hole of Design Thinking is. So I also jumped in it, dug together with fellows hands on for two full days – and we are still digging. The more we explore, the more we find. This post is about what I have perceived here for so far. We all have the gift of creative thinking. We just need to find it and start thinking mind open. Children do this all the time while playing, so we all have already once been creative thinkers. We just forgot and lose skills that we don’t use or practice. We also know what it’s like to perform our daily tasks in hurry. People are expected to been efficient to make decisions when challenges are met and needed to get over them quickly. But quite often we meet the same challenges again – one after another and day after day. To make a difference we need to stop for a moment, change how we act and learn to understand the true nature of the challenge. Look at them together with your collaborators from different point of views. Smell the challenge. Taste and listen to it, shake, turn it around, feel and live it, observe and learn. After we know the challenge throughout, we can start changing it. This is where we need to take a few steps backwards. We have to see the big picture and give space to emotions and feelings. Because if we don’t follow our hearts and base the later coming solution on feelings we won’t be able to solve the challenge in a creative way. Why? Because then we wouldn’t like the solution we would create. In this blog post, I present how you can turn your customers challenges into new service offerings. The most crucial thing is to gather as much information as you can about your service users daily tasks. In this case study, this was done by interviewing clients. You can be surprised how much your service users have to offer. They can sometimes suggest promising service ideas. 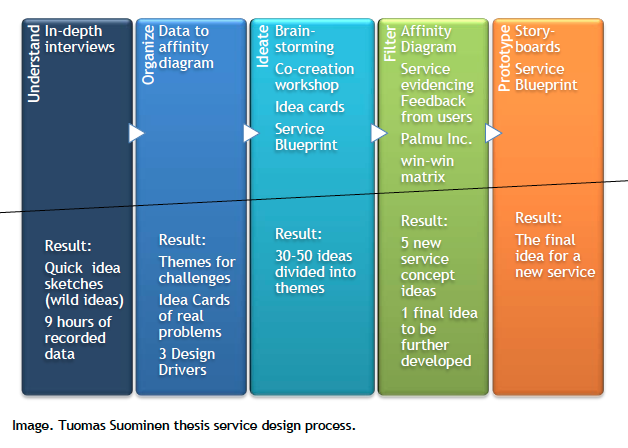 This case study was done as a thesis project at Laurea Service Innovation & Design Masters Program. I was inspired by CEO Lou Gerstners IBM turnaround. IBM was struggling in the 1990s. The new CEO sent his sales staff not to sell, but to ask customers what kind of challenges they faced daily. Gerstner realized that the company should concentrate on solving customer’s problems with their technology knowledge. Inspired by Gerstner, I too wanted to look into my client’s challenges. After all, a challenge is a latent need, and a possible service development case. I concentrated on architect clients, whose work I knew little about. I decided Service-dominant logic and service design would guide my way in this thesis. Service-dominant logic would be my base theory and service design would serve as application of that theory. I combined the two, and kept their guiding principles in mind while planning my service design process. After looking at the extant service literature, I decided to co-create the service with clients. I aimed to design a win-win service for both service provider and client. Sharpening strategic sensitivity, building collective commitment and enabling resource fluidity are major guides to strategic agility. They give insight on all that need to be done to ensure that strategies are implemented to yield positive results. Sensitivity of organizations to changes around them is not enough to make them have a competitive advantage of their product/services over others. Other factors of consideration are as well required in order to make their strategies agile and these are listed below.